The Schine Student Center will soon undergo a significant makeover, as part of the Campus Framework. 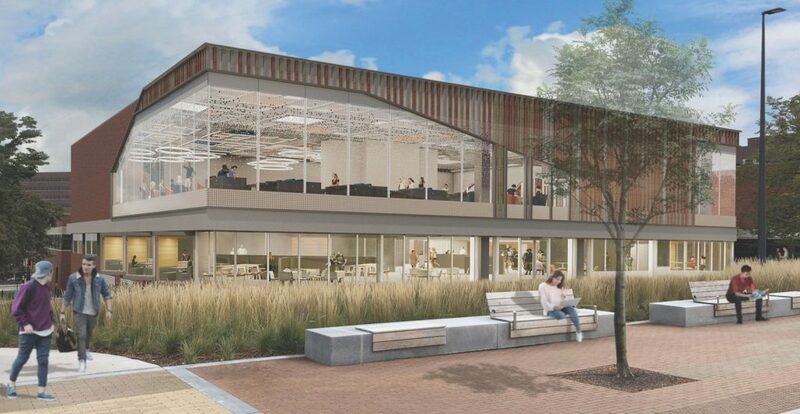 The Schine Student Center, the hub of student life on the Syracuse University campus, will soon undergo a significant makeover. The renovation, which was identified as a key component of the Campus Framework, a 20-year roadmap meant to guide future campus planning and development, will begin in May 2019. The announcement comes on the heels of the Nov. 9 Board of Trustees meeting, during which the Board unanimously approved the planned renovation. Dolan Evanovich, senior vice president for enrollment and the student experience, says the renovation will support the University’s continued efforts to enhance the student experience. “This Campus Framework initiative is paramount to advancing the student experience inside and outside the classroom. This renovation will allow the Schine Student Center to better meet the needs of students today and in the future,” says Amir Rahnamay-Azar, senior vice president and chief financial officer. Integral to the planning and design process was the campus community’s engagement, including during the feasibility study and rendering feedback opportunities. More than 1,600 people, most of which were students, provided input during meetings, residence hall surveys, dining center pop-ups and other campuswide feedback opportunities. Robert Hradsky, senior associate vice president and dean of students, echoes Salih’s sentiment and stressed the importance of the campus community’s engagement in guiding the building’s design. Additional details regarding services, relocations and construction will be provided on news.syr.edu and campusframework.syr.edu. Email updates will also be shared with the community via the Office of Campus Planning, Design and Construction email updates.